This lovely spacious and bright detatched villa is located within a 5 minute walk from the pretty village of Fuente Camacho, 45 minutes from Malaga and the coast and 40 minutes from the historic city of Granada. The property has been built and fitted out to the highest of standards and using top quality fittings and materials. It is decorated beautifully and in immaculate condition throughout. Internally the house comprises a fully fitted and integrated modern kitchen with granite worktops and breakfast bar, an independent dining room with feature wooden beamed ceiling, sitting room with log burner and access to the main terrace, spacious master bedroom with ensuite bathroom, guest bedroom with ensuite shower room and access to the terraces, there is also a further small room which accesses the guest bedroom and can be used as occasional bedroom 3 or a study/office plus a family cloakroom. The house has full central heating, double glazing plus all mains services including electricity, water, telephone and broadband internet. Outside there are lovely gardens with mature plants and shrubs, extensive terrace areas and a beautiful 8 x 4 metre swimming pool with Roman end and leisure terrace. The formal garden areas are fully fenced and gated and the entire plot of land extends to 16000 sq mtrs. There is a workshop and storage area and ample parking areas. The views from this lovely property extend across the countryside to the mountains beyond and there are beautiful views to the village which sits just a few minutes from the property. The village has a supermarket, bars, restaurants and a school and lies just 5 minutes from the motorway with access to the inland and coastal areas. 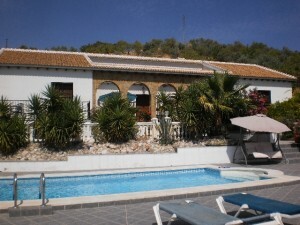 This is a beautiful property and is perfect as either a family home or a lovely holiday home. It is priced very competitively to secure a sale. It must be seen.